When it comes to food, some matches are made in heaven! 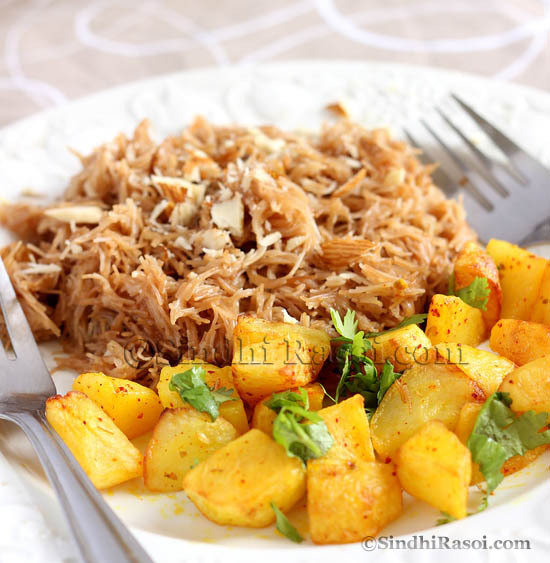 Here are some of the most delicious Sindhi food combinations that you must try if you really want to taste the true flavors of Sindhi cuisine. Ranging from humble dal rice to ‘inspired’ macaroni curry, from soul soothing Kadhi -rice to signature Saibhaji pulav, here is an exhaustive, lip-smacking list of all the favorite meal combinations of Sindhi people. Enjoy! 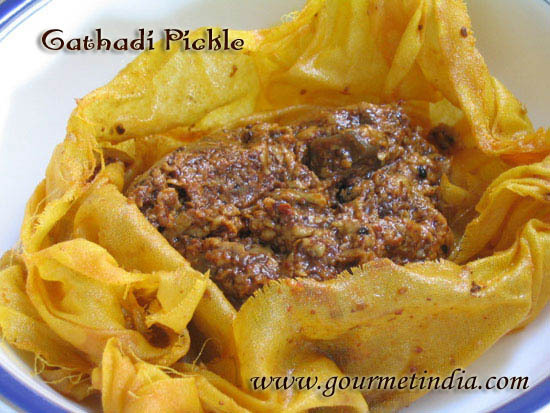 Before I forget, please take a note that eating a Sindhi papad and some pickle with many of the meals mentioned here, will give you that authentic ‘Sindhi maani‘ (meal) feel ! 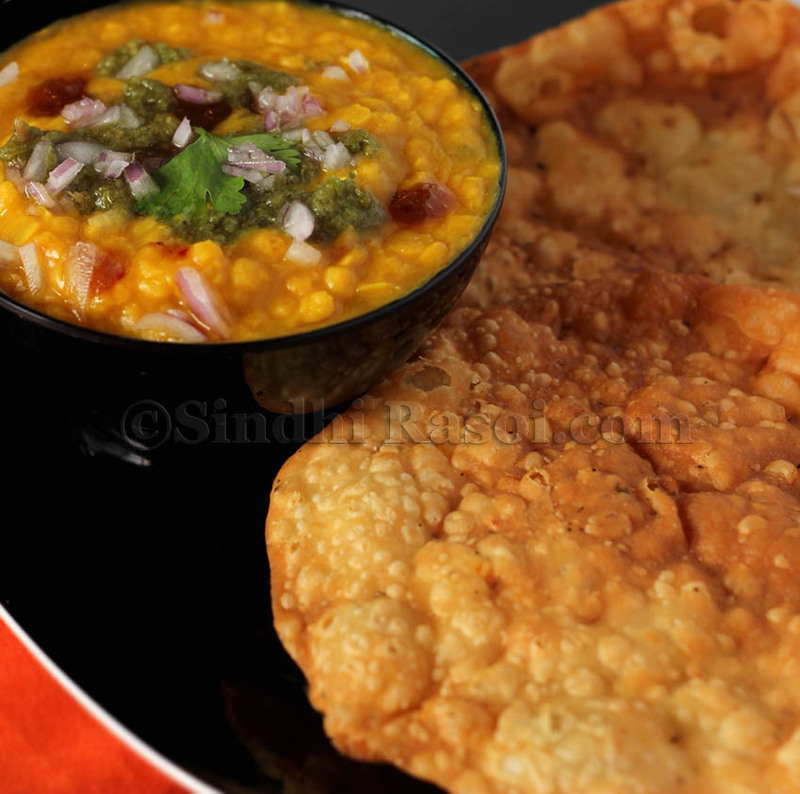 1) Dal- Pakwan : Nutty, mushy dal scooped with crispy crunchy pakwan, with a dash of mint coriander chutney is a hands down winner when it comes to the most popular signature Sindhi breakfast. 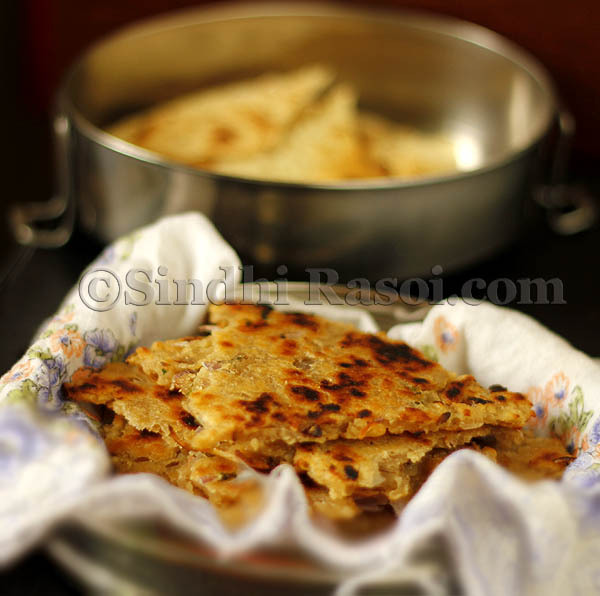 2) Koki-Papad: Almost a staple Sindhi breakfast, thick spiced up roti called Koki is often had with papad. Grab some hot chai or chilled yogurt and you will end up eating a quick fix, filling and most satisfying breakfast. If you are lucky enough, you can fetch some spicy dal moong from the nearby thela. 3) Seyun- patata: The sweet, rich, vermicelli with savory shallow fried, soft, spicy potato chunks is yet another favorite combination. A must try!! 4) Chaap- Chola : Get over the regular aloo tikki with ragda; the Sindhi chaap chola made from the patties stuffed with boiled and spiced chana dal, and shallow fried till crisp, tastes divine. 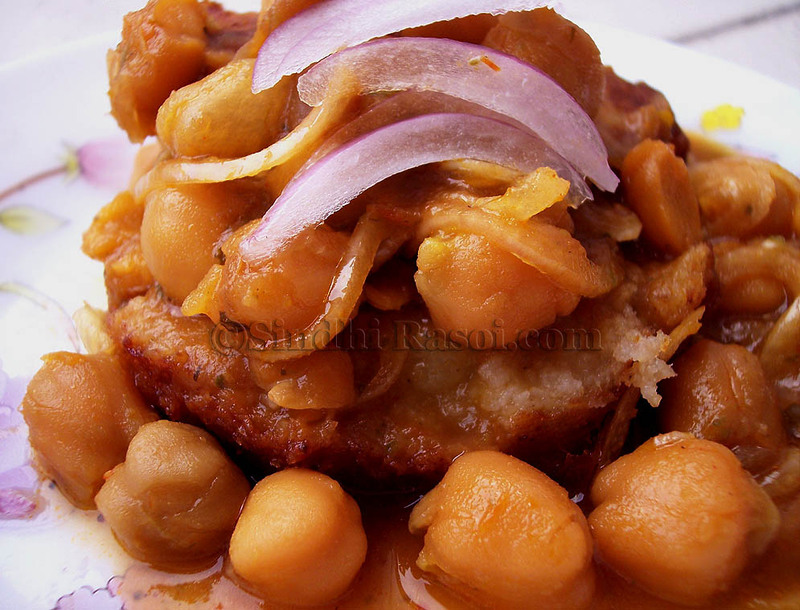 Topped with spicy, flavorsome kabuli chana curry, chutney and crunchy raw onions, this street food will surely blow your mind! 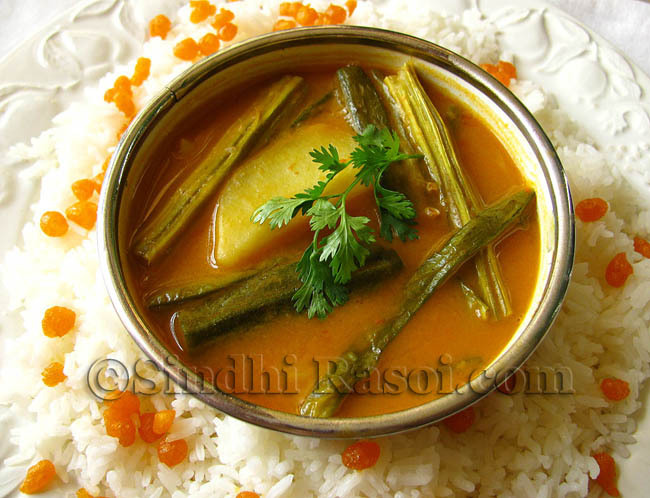 5) The mighty Sindhi Kadhi- chaanwaran:Enough said !!! Healthy and wholesome, this delicious Sindhi style spinach subzi tastes awesome with rice cooked with caramelized onions. The sinful, crispy double fried arbi adds an element of crunchiness. 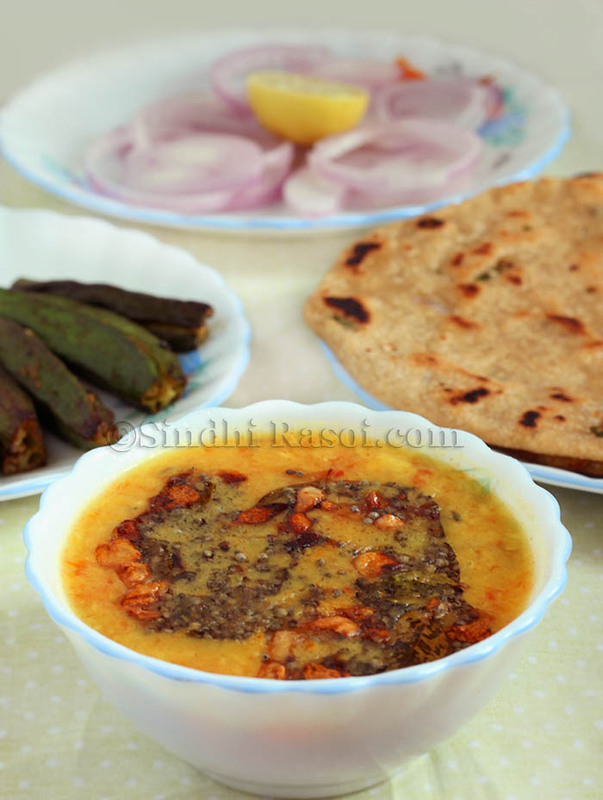 Have it with some traditional Sindhi pickle and the I bet you will crave for this kind of meal again and again! 7) Tidali Dal- Dodo: Another healthy combination where the simple nutty flavors of three kind of lentils compliment well with patted sorghum roti. A rustic meal that is best enjoyed with some raw onions and side dish of your choice. 9) Tayri-Vangan patata:This sweetened rice flavored with fennel seeds, Kopra and black raisins is a sacred food for Sindhis. Served as prasad on all auspicious occasions, this tayri /tairi tastes great with Vangan patata (Brinjal and Potato curry). 10) Varyun waara Chaanwaran ain Macroli phoolpatasha: Spicy Amritsari wadi cooked with caramelized onions and rice, when served with macaroni (yes, pasta sneaked into our kitchens eons ago!) and fox nut seeds curry, will blow up your taste buds ! 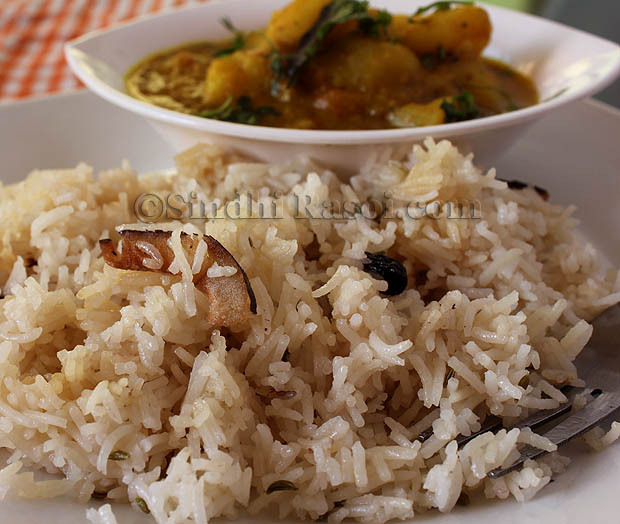 11) Degh waara Chaanwaran ain Bhee patata:A traditional food cooked on logs during wedding ceremonies, this smoky spiced up rice with lotus stem and potato curry was one of the reason that non Sindhis used to gate crash Sindhi ceremonies ! To get this awesome recipe, click here ! 12) Seero Malpuro:The rich syrupy fried Malpuras with equally rich, melt-in-the-mouth semolina halwa is such a heady combination. Ever tried it? And to wind it up, this Sindhi Thali that is capable enough to send you into a food coma ! hi…..! Can you please add chillo in sindhi recipe , tariyal vangan(fried brinjal) and puri with tariyal patata. 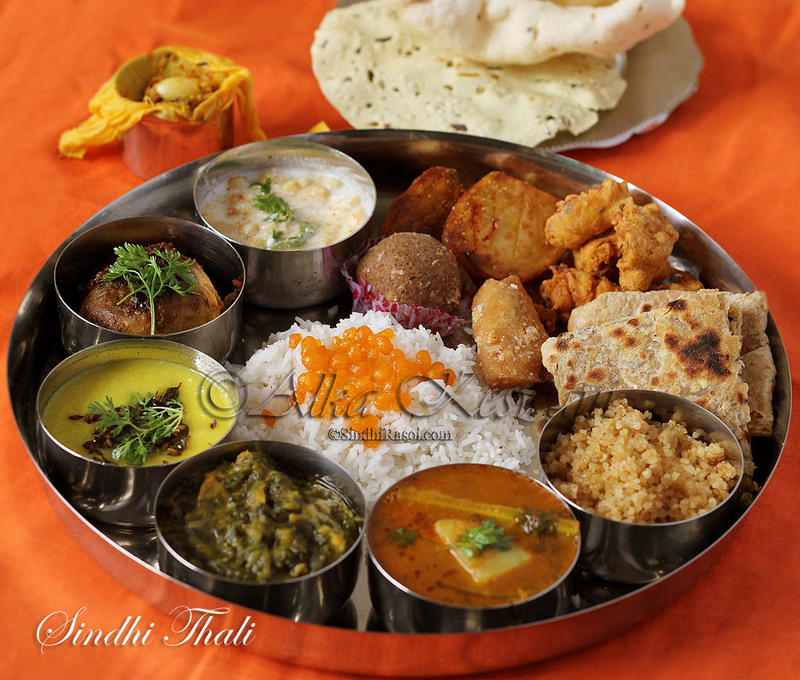 Hv seen ur thali n other recipes …feeling so nostalgic…. 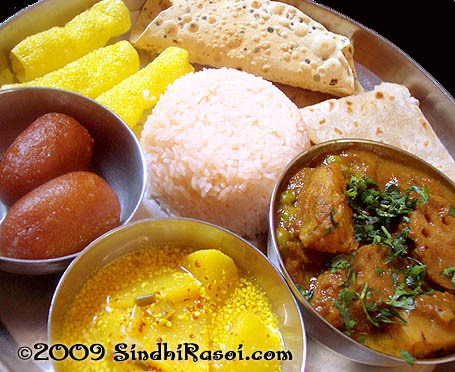 Where is Whole some Sindhi Thali available in Mumbai??? Y97 have forgotten GHATHIYAIN JI CURRY. 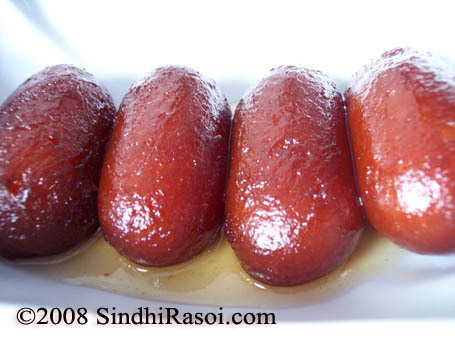 It is very yam I.
Alka, you’ve forgotten to mention the SIGNATURE mithai of Sindh…. I forget its name….but made of sev and mava…. favourite of Sindhis during Diwali at Khar and Andheri etc. It can replace “Seero Malpuro” hands down. My cousin shared this blog today, while going through all those mouth watering dishes and comments, felt to say thank you for making nostalgic about so many memories attached with these dishes. My mom use to make in Sindhi sonjare ka Gul, drumsticks Gul…that bhaji was so delicious….but I have forgotten the recipe… please guide.. 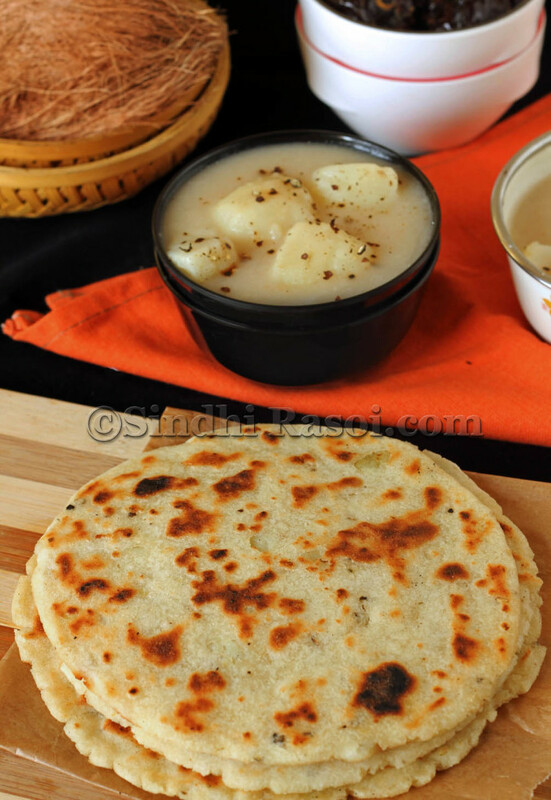 Very popular for breakfast is Seyal Mani and saye masala bread. What about Palo, gosht daba rooti bookyoon kapoora? 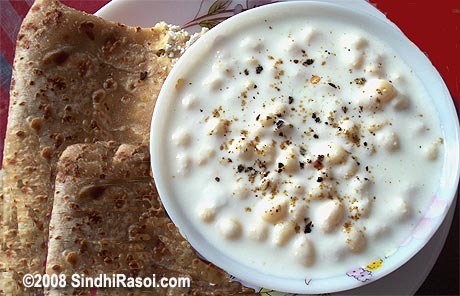 Tayri Saag is also one of the traditional dish which is yum. i swearvthey know what sindhi foods also taste like. stay connect to the roots.. . khirni.. daal moong.. kunne ja beeh… beeh ja pakoda.. sanha pakoda.. tikki..foodney ji chutney..
Dont forget our traditional food gwar patata and singhi patata…. Seyal bread or seyal fulka… quick breakfast recipe! 3 cheers for your page jeeye muhinjee Sindh ……! Lola and achaar combo is also too much..
Great collection n description of some Sindhi Classics. I also love Swanjhro and khatto bhat. 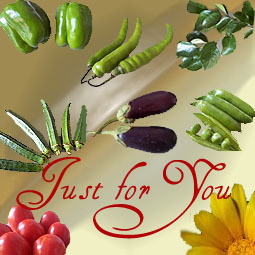 I would like to add in the list..
Mung daal Jo phulko, meetho lolo, aci palak will be ideal combination. 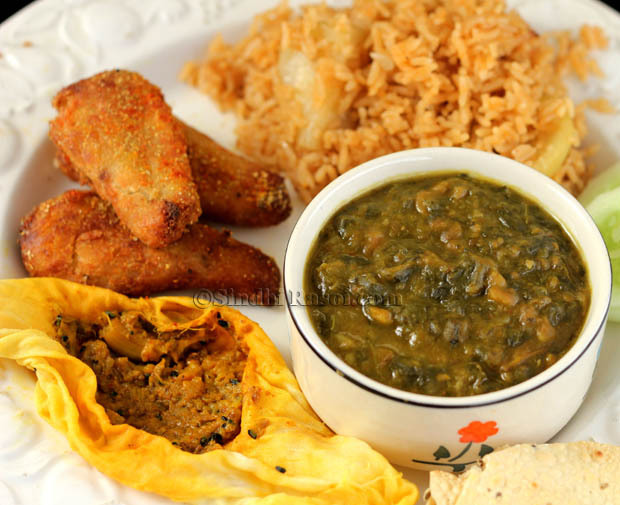 Daal Jo Phulko, Meetho Lolo and aci palak will be ideal combination. Thanks for sindhi famous varieties ! I would love to add Seyal Bhesan Jun Tikkyun. The most favourite in my list. 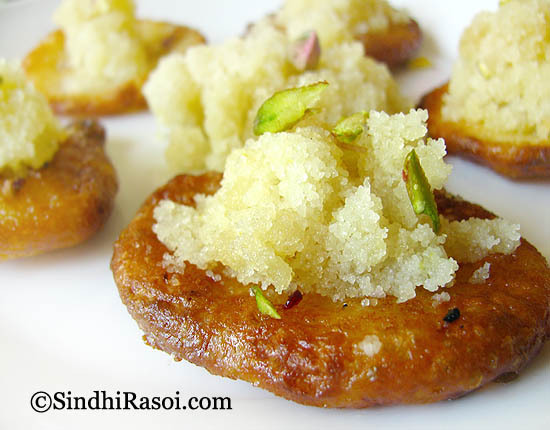 To be in touch with sindhi food lovers would be simply amazing. what a awesome thali! Drooling. 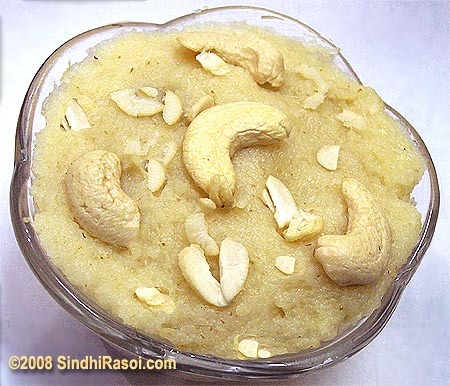 Alka I am doing a Sindhi A-Z , looking for recipes with alphabets like Ę, I , X and Y. Do you think you can think of something? Thanks a ton. 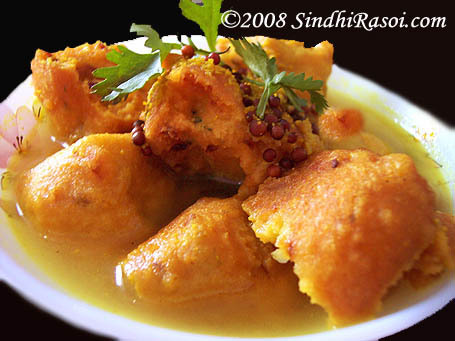 I wish someone from Delhi can let us know if there are any Sindhi food joints there. I am Chitra from Delhi and you r right.No single Sindhi Joint is there in Delhi and I am also trying to contact if anyone is ready to open a food outlet at lest for sindhi breakfast / snacks. There are lot of combinations available viz a viz Saiun patata, Pakwan daal, Sahal Bread, Sahal phulka, Koki, Satpudo and baide ji bhujj, mungan ji daal jo parantho (daal pai), Mungan jo parantho sayi thoom varo dodo with butter, Sai thoom wari koki with butter etc. etc. There used to be a little Sindhi hotel outside BHU campus which BHU-students regularly visited (I ate there once; good food). Don’t know if it is still around. Great work and detailing.. Maybe missed out on mitho lolo and sarhain ji bhaji… And of course, all the yummy non- veg options: gosht dabroti, seyal machhi, pava, chops… Would love it if you could share some lost non- veg recipes..
Is sarhain same as drumstick flowers? I think I have heard this word before but can’t recollect it. Also since this blog is only about veg recipes, I can’t share list of non veg recipes here. 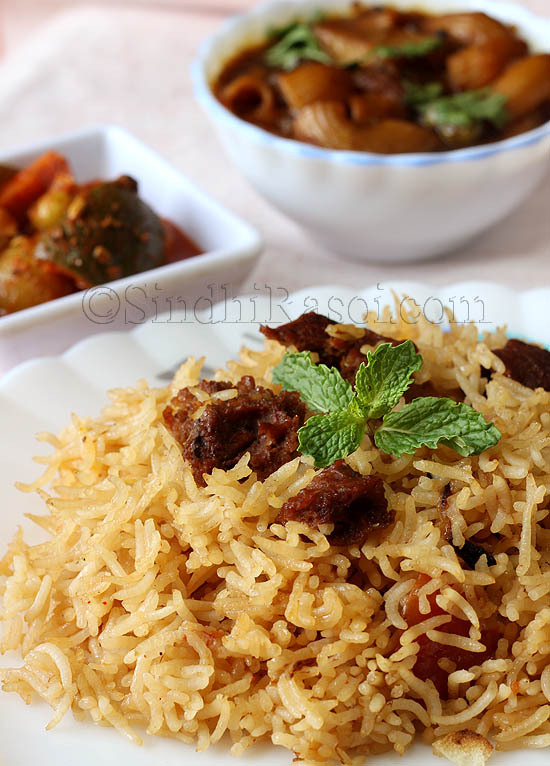 But you can check my another blog http://recipeonclick.com,where I try to share Nonveg Sindhi recipes. Drumstick flowers are called swaanjre ja gul..
if I am right it is swanjaren ja gul and are drumstick flowers, available during dec to feb months. 3 daali dal & guar. You might have forgotten about Mohan thal with salt &peeper kooki . Also halway ji kachori with churi mung dal and sengun jo siro and puri ! Yummy yummy breakfast ! Done ! Have linked those that are up on blog.The rest (ladoo and tosha) were store brought but I do have those recipes in case you need to make these sweets at home. Papd and kheecha (rice poppadom) too were store brought ! Alka, you got me drooling over with all those fantastic pictures..I am now floating in a food coma!..that thali is something I am planning to make!.. So nice to see all our traditional recipe combos…I crave for so many things that we don’t get here in Brazil. I do try to bring as much as possible during my visits to India. Thank you dear! And I know how it feels..I miss the street food of my home town and there are so many ingredients that just do not taste same when I buy from the places around our new home !